Deb from Kahakai Kitchen is the host for this round of Cook the Books. She selected Farmer Boy by Laura Ingalls Wilder. This book, one of eight in Wilder’s “Little House” series, depicts the childhood of her husband, Almanzo Wilder, in New York state. When I was nine or ten, I was introduced to Wilder’s entire “Little House” series through my grandmother and my mother. My mom had read them all in her youth and my sister and I scavenged some copies from our grandmother’s attic, books that my mom, aunt and older cousins had read. (We got remaining copies for our birthdays.) 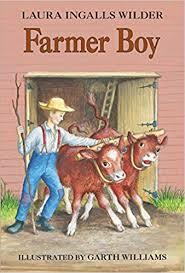 I remember devouring them all but I think that Farmer Boy might have been the last book in the group that I read. I also remember that it wasn’t my favorite. Perhaps it was because it was not about Laura and her immediate family or because it was about a boy…I don’t know why I was prejudiced against the young Almanzo. So, I was please to have the opportunity to re-read this book many, many, many years later. And, I was amazed (amazed, I tell you) as to the amount of food in the book. 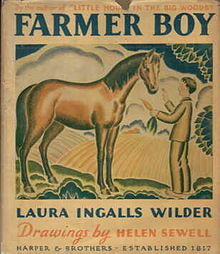 It seems like Almanzo’s memories and recollections (from which his wife based this novel) always revolved around food. Here’s just a sprinkling culinary references from Farmer Boy. Of course the Wilder family put up lots of preserves and pickles, dried corn and apples, and butchered their own meat. Nothing was left to waste—apple cores were used to make vinegar and the hides of the butchered animals were utilized for shoes. 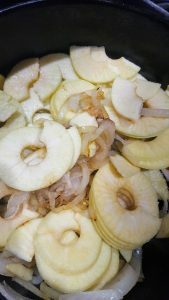 How would the Wilder family have used my apple scraps? 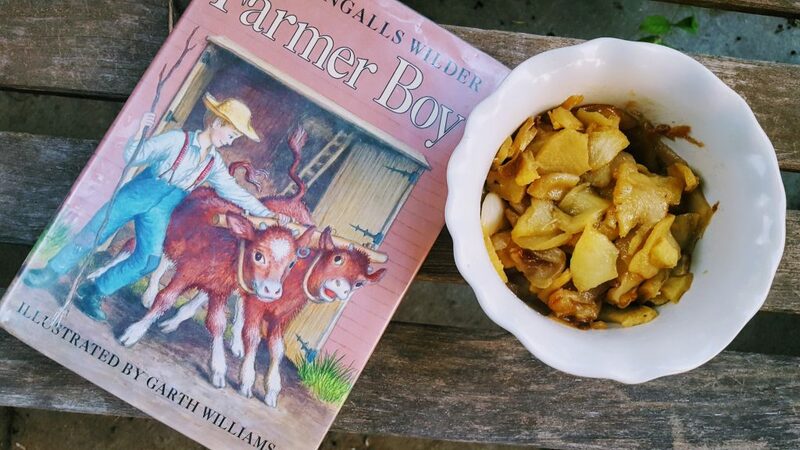 Almanzo said that what he liked most in the world was fried apples ’n’ onions. When, at last, they went in to dinner, there on the table was a big dish of them! Mother knew what he liked best, and she had cooked it for him. Almanzo ate four large helpings of apples ’n’ onions fried together. This recipe is inspired from Farmer Boy’s favorite meal. Melt butter in a medium cast iron skillet. Add onions. Cook over medium-high heat until onions are slightly caramelized (15-20 minutes). Add apples, salt and nutmeg. Cook another 15-20 minutes or until apples are soft. 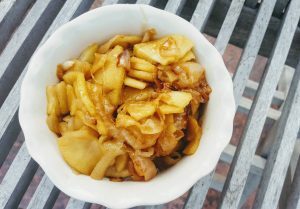 I used Golden Delicious apples for this recipe just because they were on hand. This was a very delectable dish, in between a savory side and a dessert. In fact, The Hubs had two servings for dinner. I am now thinking of a onion-apple pie and a Thanksgiving dish with a bit of bacon. Wouldn’t that be crazy delicious? Thanks for leading us down memory lane with this selection, Deb. 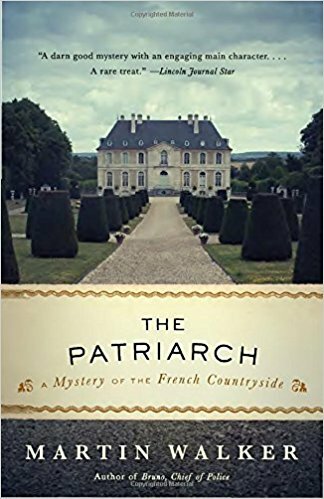 Please join Cook the Books for the next reading selection, The Patriarch by Martin Walker. Claudia (Honey from Rock) is hosting for October/November round. 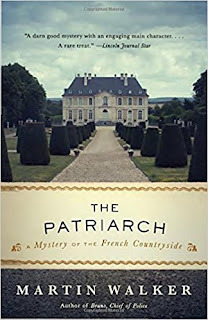 Claudia states, “I have been enjoying his books for a few years now, and wanted to share at least one with Cook the Books, for all the fabulous food and wine included.” “Fabulous food and wine” is enough enticement for me to check out this book. I am also linking up with Simona’s Novel Food #31…. I love that original cover! Me, too. I don’t think I had seen it before. To answer your question about apple scraps, I think Almanzo’s pig would have eaten them 😉 Glad you made this dish because I was wondering what it looked like: apple and onion is an interesting combination. Now I’d like to taste it as well. 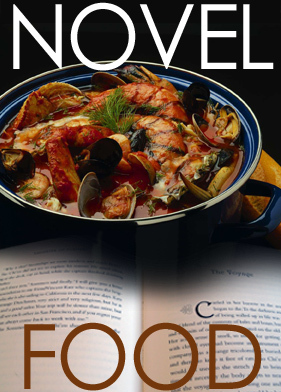 Thank you so much for contributing again to Novel Food. And the cores to make vinegar! 🙂 You should taste this. Delish! I almost made this myself so I’m glad someone did. It looks delicious. Apples are definitely a big thing in this book. 😉 Thanks for joining in. 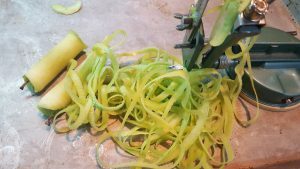 Yep, lots and lots of apples….and pies…. Thanks for hosting this month, Deb. I love this stuff and it will be a part of our recipe repertoire. Onion and apple are great together and I bet it will taste very good with some sourdough bread. That would be good. I had some for lunch just by itself. Still pretty good as leftovers. Great minds Debra. Isn’t that apple/onion combo superb?!! I almost made it as well, still going to – soon, and glad you did. Sounds so good. Bet it would be a fabulous side with baked ham. Any pork would be good! Thanks, Claudia. I love the idea of updating this recipe to add in some bacon! What a great recipe! Perfect for the upcoming holidays, I think.